By definition, a retailer, or merchant, is an entity that sells goods such as clothing, groceries, or cars directly to consumers through various distribution channels with the goal of earning a profit. This merchant can be a physical building or online. In the case of large retailers like Walmart and Target, the items they sell are purchased from a manufacturer or wholesaler and sold to the end user at a price that is marked up. That's usually the source of the retailer's profit. But the term "retailer" doesn't just apply to large stores. Another example of a retailer is the small family-operated pharmacy in your town or your local grocery store. In general, retailers don't manufacture the goods they sell. There are some exceptions to that rule, of course, but usually, the retailer is just the final link in a supply chain that gets a product to a customer. The difference between retailers and wholesalers is that while retailers sell directly to consumers, wholesalers sell their goods to other businesses (i.e., retailers). The main categories of products that retailers sell include food, hard or durable goods (such as furniture or cars, which are products that are used over time), soft goods (such as clothing or footwear, which have a lifespan), and art goods (such as books, musical instruments, or art supplies). As you'll glean from the list below of the 10 biggest U.S. retailers, they run the gamut from companies that sell food to those that sell medicine to online storefronts. Stores with brick-and-mortar locations aren't the only kinds of retailers. There are hundreds of thousands of small sole-person enterprises selling their goods online from bath oil beads to Bermuda shorts. Less traditional businesses also qualify as retailers. For example, an artisan who sells homemade jewelry at a crafts fair is considered a retailer, as long as the person is selling goods to consumers in order to earn a profit. Retailers aren't only in the business of selling goods; they can also be service providers. For example, the consumer electronics chain Best Buy has a Geek Squad department in its retail outlets that offer repair services for the products it sells. Plus, the Geek Squad makes house calls and has an online customer service operation. 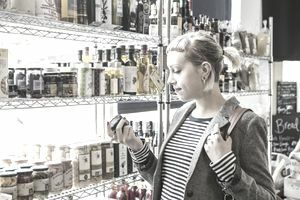 Today, a retailer needs to be omnichannel, which means that they must sell in more than one kind of venue (or retail channel) to be successful. For example, Amazon has added brick and mortar stores as an adjunct to its digital operation. Today's customer likes to have multiple options to purchase from their favorite brand. While some consumers like the convenience of shopping from the luxury of their own home, others want to be able to interact with a product before buying it—especially when it comes to clothing, where the weight and feel of an item are key. GS1 retail industry standards. These standards focus on supply and demand chain management, the most prominent of which is the GS1 number system used in Universal Product Codes (UPC). The GS1 numbering system standard works to increase operational efficiency by providing a way for retail businesses to manage inventory and conduct checkout activities electronically. UPC codes typically include a manufacturer’s identification code and merchandise identification and pricing information, among other standards. In addition to standards for barcode technology, GS1 includes industry standards for formatting electronic communications ranging from pre-purchase messages to transmitting payment information. The American National Standards Institute Accredited Standards Committee. All standards for electronic data interchange are set by the ANSI Accredited Standards Committee. Although ANSI standards aren’t specific to the retail industry, many retail businesses adopt them as standard operating procedures. For example, EDI is a document standard that provides a common interface between two or more computer software programs at different locations. They are what allows a retail business to transmit ordering information from a store or a business website to a third-party distribution center or warehouse. All retail operators should be familiar with the various ANSI standards. Before you start selling, make sure you have all the necessary documents, legal and otherwise, that are required. You'll need to get an Employer Identification Number (EIN), which is like a Social Security number for your business. Most vendors you will work with will require you to have an EIN before doing business with you. It's free to apply for an EIN, which you can do on the IRS website. Having an EIN means that you'll be responsible for a variety of taxes, so know what your local and state taxes are, and become familiar with what you'll be expected to pay the federal government. Check with your local Chamber of Commerce if you're unsure how to proceed. Retailers also need to have business licenses, according to the laws in your city or state. Check with your local government office to find out what you'll need. Local and state laws will also determine if you need a resale license, an industry-specific certificate, or a certificate of occupancy for your brick-and-mortar stores.